A lot of new products are announced at trade shows and other events, such as CES for consumer electronics, International Builders Show for construction materials, and the National Association of Music Merchants for all things musical. For many product people, participating in their industry trade show each year is one of the most important things they do. The real pros who know how to launch products at trade shows are the ones who know how to compete for attention in noisy and crowded environments. It’s a real skill. They quickly capture interest and generate opportunities. Consequently, they have knowledge and experience Everyday Innovators should have as well. Which is why I spoke with one of the handfuls of people who large brands trust to announce their products at trade shows. 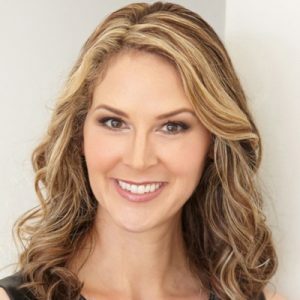 She is Amy McWhirter, corporate event host, emcee, and trade show presenter. Her superpower is engaging audiences in an authentic way that creates connection. [2:54] You’ve helped launch numerous products, but you’re not a product manager. Tell us about your work. I am a professional trade show presenter. I do not work for any of the companies I represent, but people often think that I do. I am hired to talk about a product or service at a trade show. I started as an actor doing commercials and corporate videos. I presented at auto shows and other B2C events and discovered that there was a whole B2B trade show world. That’s where I’ve been ever since. [8:02] Who from the organization typically hires you? It’s usually marketing or an events manager. There’s always a product marketing person or a director of marketing involved. The CMO may also be included. Sometimes I meet people at trade shows who see what I do and want me to come work for them. [10:31] What is a product launch that stands out in your mind? I just finished a series of two shows for a company for the second year. Rinnai just launched its tankless water heaters in the U.S. The company is well known around the world, but not in the United States. They recently made some changes that made the water heaters much easier to install. We wanted to get the word out that the products were less expensive and easy to install. [12:05] How did you work with the company? The director of marketing contacted me a few months before their two big shows. I started by working on the script with the marketing team. We used animations behind the screens as visuals and crafted the presentation from there. This was my experience using a touch screen at a show, and people were very engaged an interested. I personalized the script to make it sound natural and relatable. I also had to time out the script so it fit with the animation. [16:40] What are the elements of a good presentation? The standard attention span is 5-6 minutes. It’s enough to grab attention and encourage people to learn more. People’s attention spans are shorter than they used to be. The content should speak to how the product will address a customer’s pain points and end with a call to action. Most often, that’s coming into the booth for a demo. The visuals are also important — what’s compelling and what will tell your story the best? PowerPoint is still used, but increasingly people are adding animation or video to it. Audio is another important component, and having a dedicated A/V person is key. [22:49] How should the content be structured? Avoid marketing speak. The content should not sound like a brochure. You are trying to connect to people on a human level. The content can be high level and still draw people in. One of my clients used an “I Love Lucy” theme last year. Not everyone knew the reference, but enough people know it to make it relatable and break the ice. [27:18] What are common mistakes people should avoid when making presentations? If there’s an obvious distraction or issue, acknowledge it. Don’t just ignore it because people will be drawn in by it. Don’t wander too far from the screen; it makes it difficult for people to pay attention and makes it seem like the presenter is distracted. Recording yourself practice and watching it back can help catch some of these things. Having a plan and not going too long is also important. Don’t forget to connect with the audience. You need to be really prepared and know the material so you can get out of your own head and focus on connecting with people.